ShayWhiteGrow, sd401k, yourtokingbuddy and 2 others like this. After playing around a bit more, I might have to eat my words about the Miqro not being a daily driver. I'm finding it at lot easier to maintain a particular feeling as I want to compared to the mini rollercoaster of some heavier hitters in my collection. I'm also loving the carry case for travelling to friend's houses. It keeps the smell in and off the fabric of my bag which is especially handy when I haven't given the mouthpiece a thorough cleaning in a few days. That said, the cleaning process couldn't be easier. I know a lot of people were concerned about the cleaning of the Miqro based on how the IQ was about having hard to clean spots but so far a daily chimney sweep brushing of dry herb out of the chamber and off the pearl (basically how I treat any other electronic vape) and an as-needed alcohol soaking for any longer than 15 minutes will bring it back to like-new cleanliness. No complaints about the maintenance process at all so far! How's everyone else liking theirs? And for those on the fence, what concerns have you got? StringTheorista, Jill NYC, Grey hair and 4 others like this. Thank you for your review and inviting questions from fence sitters! *Ease of full cleaning- which you elaborated a bit on- thank you! *Longevity of the device-but I'm not sure this is a question that can be addressed at the moment, being how young the model is. Liking this device more the more I use it. Vapor is well-cooled, especially with the extended mouthpiece, which I prefer. Flavor is very good, albeit you need to clean frequently to keep that true. I guess because the vapor path is so tiny, it can get dirty faster. Fortunately cleaning is easy. I haven’t bothered with soaking anything, just running an Everclear-soaked pipe cleaner through the vapor path and swabbing the oven and pearl with soaked Qtip. There’s a little spot in the mouthpiece that collects debris quickly, and degrades taste when it does, but it’s also easy to clean with a pipe cleaner. The whole process takes maybe 2 minutes, then I let air dry before reassembling. It’s introducing me to a slower, more mindful approach to vaping. Previously almost all my (limited) experience has been with lotus and vapcaps, both quick on-demand vapes. Especially vapcap excels for taking a few pulls and then on to other things. The 40 seconds or so of warmup slows me down and I am liking that. It gives me time to focus on my experience and not rush through it. The warmth is a real question. It gets quite warm, not hot, at least as I’m using it, on the cooler smart paths and for less than a 5 minute session. Don’t have the glove, can’t speak to that... I think you’d need to test one to know for sure, @Vapeur Rogue, since your issue is so subjective and important. Jill NYC, stark1, stickstones and 2 others like this. I'm still struggling with my Miqro. Everything seems to work fine but I'm ready to shelf it at this point. Taste is bad no matter what I do, only thing that slightly improves it is packing the oven hard so airflow is heavily restricted. But it still tastes just bland. Still not sure what I am doing wrong with this thing or if I got a bad unit or something but really unhappy with my purchase so far. Tastes bad? That's not good. I wonder what you may be doing wrong. Every other report here bucks that trend so far. Probably not the material right? I'm sure you have access to the best. I hope you get this figured out. I've been waiting to drop money on one but not sure if I need another session toy. @Quasi, did you take out the mouthpiece, remove the silicone seal, and clean in the little side port that the seal covers? That’s an area that seems to collect little bits of material that affect taste. I have fully cleaned and tried both mouthpieces and have not noticed a difference in flavor. The Lotus was one of my first 2 vapes, still love it! Yeah- I know I may just have to try it to know on temps-I share your interest in mindfulness ritual with vaping when vaping for maintenance, or my non-acute issues. I also just kinda want to try a DaVinci model finally- the company gets so much love! Thanks again! Copacetic and Vapeur Rogue like this. Mine has occasionally, but it hasn't been a problem for me as the extended part of the MP has kept it from actually dropping out of the top. @Davinci_vaporizer, is there any reason I should not use an 1100mah replacement battery in the miqro? Jill NYC, stark1, Memphisfiredepartment and 1 other person like this. I've had my miqro for a week now and I'm really loving it, but the smell makes me nervous... It's great to take out and about (with extra batteries of course) but I feel like I'm nose blind to it and I have no idea how much it smells in my pocket . Jill NYC, Davinci_vaporizer, Grey hair and 2 others like this. My girlfriend commented for me to be wary of the scent while out in public a few weeks ago, though I think this was more from the exhalation of hitting a freshly packed chamber (majority of the smell and terpines are in the lower range from my research) than it was the Miqro itself. I can definitely say though that when opening the chamber, even after sitting for a day and a half, if you've got some loud herb you're gonna smell it upon opening, and if you're gonna be concerned about the pocket smell be sure to clean the mouthpiece regularly. I've currently got a grinder with a finer grind than the size of the holes in the ceramic chamber are, meaning I occasionally get (very) minor scooby snacks and some of that gets stuck in the flat mouthpiece. This leads to more smelliness than anything else of the device in my experience. Based on this I would say 1) Clean (at minimum) the mouthpiece regularly to minimize smell building up and 2) Consider the Soft Case to help keep that contained. I know everyone has their preferences, but for me I'm okay with whatever the vaporizer wants. The Miqro definitely has more resistance than my SBJ or CFX but with as tiny as the piece and vapor path are, I think this is more than excusable. Plus it takes time for each hit to build up so a little bit of resistance doesn't bother me at all for how well it works. *How warm the body of the vaporizer gets to touch, even with the glove. I think for most people even the bare body would only get slightly uncomfortable at Smart Path 4 (410F-430F over a 5 minuite period). For your specific needs though I would strongly recommend getting the glove. An ounce of prevention is worth pound of cure, after all. Can I ask what temperatures you normally vaporize with, and does this exacerbated discomfort extend to your lips too or just your hands? A swappable battery, which means that unless there's something significantly wrong in the build the only thing you're going to have to do is spend $5-10 on a new battery every so often. 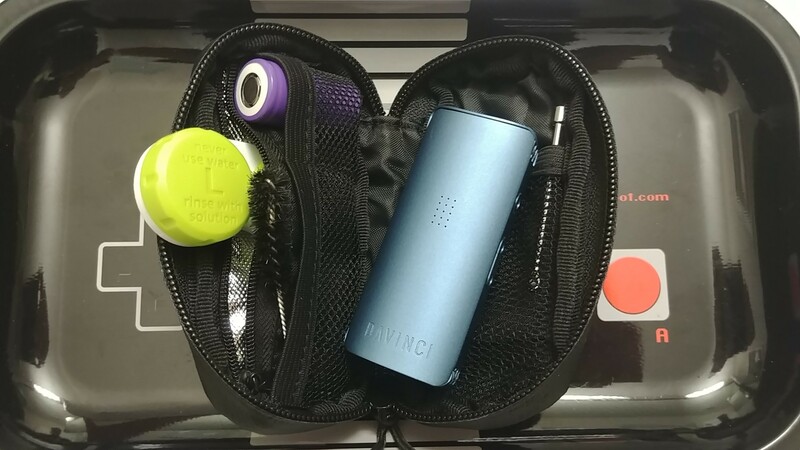 Moving forward all of my electronic vaporizers will have a removable battery as it puts more control in the user's hand and less on the manufacturer to have chosen a quality battery at the time of manufacturing. If Davinci can make a device in this size with a removable battery at this price point then the Miqro certainly won't be the last device. Overall the build feels great in the hand with no rattles or any sound at all when shaking it around, and if you add the glove in it will certainly absorb some of the shock of accidental drops in most circumstances. arb, Jill NYC, hujdimislav and 3 others like this. What are your issues? I am reviewing the unit currently and I love it for micro dosing? Which mouth piece are you using? FC Fam, I Want Input on your experiences with the miqro trying to craft a video review after I do a right up on here. I want everyones input pros and cons. I want to tackle all te issues you guys are having in a solutions review to some of the posted issues such as airflow I have a great fix. Hi There! Wanted to give you some tips! You want to be particular about your material as that will be very important to your overall experience. What strain are you using and how have you be containing it? Sometimes material can get dry and that takes away the terpenes. You also want to be mindful of the temperature you're vaping at. You will experience optimum flavor at lower temps. Try smart path 2 and 3, temps 300 - 370. When you vape over 400 you're combusting and losing flavor. What? You're saying that the Miqro (or IQ for that matter) have the ability to go to combustion temps? Why would you do that, especially since these vapes are not meant for concentrates? It won't be combusting at that temp. thanks for checking in on I'm really new to tracking the specific temperatures, having started with butane vapes ( Lotus, Vapwood and FW2) and to this day do not have one that has a digital readout- but referencing darkness of ABV, and using other folks reviews as feedback- I stay within medium and high temperatures, but then mostly back off before full browning. Yes- the FW2 will hopefully remain my only foray into nonremovable batteries in vapes! *Indeed on prevention. I know when I need to take ice packs and cooling cloths with me when I go out in summer! Regarding Digital Display- Tubo evic, Lil'Bud Elite are in my plans. Possibly the Fierce too. Ya know what I stand corrected lol... I meant to refer to carcinogens. When you vape over 385 you're activating this. Sorry guys! I am indeed new to vaping, it's only been a year, but I'm constantly learning ;-). Sorry for the confusion. Jill NYC and Vaporcussion like this. Davinci_vaporizer and StringTheorista like this. And the battery- we have a 900Mah that comes stock, although our engineer said he was testing 1200 Mah batteries as well. If you can find one that's "really" 1200 Mah, might get an extra session or two out of the unit. We're always searching for upgrades here too.